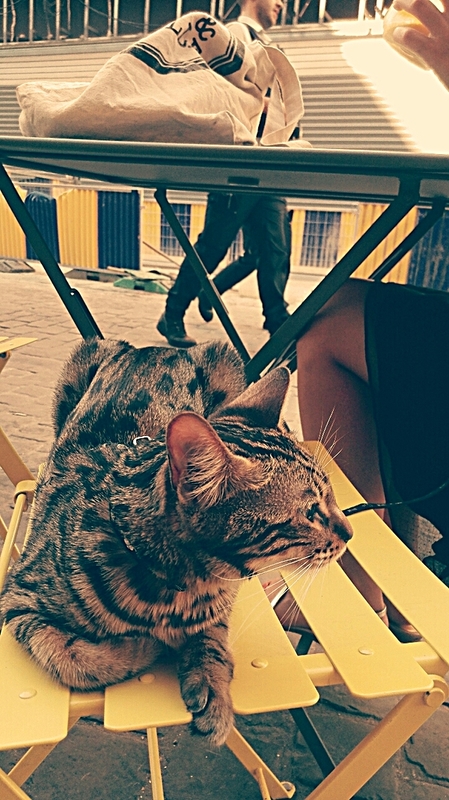 This cat follows his owner everywhere throughout Brussels. Here, he was visiting the cafe Peck 47. I often go here for lunch (their wholegrain sandwich with sweet potato and cilantro is the best) or to work on a book while sipping on one of their homemade lemonades. You should, too, if you're ever near La Grande Place. Who knows, this kitty might be visiting again. P.S. 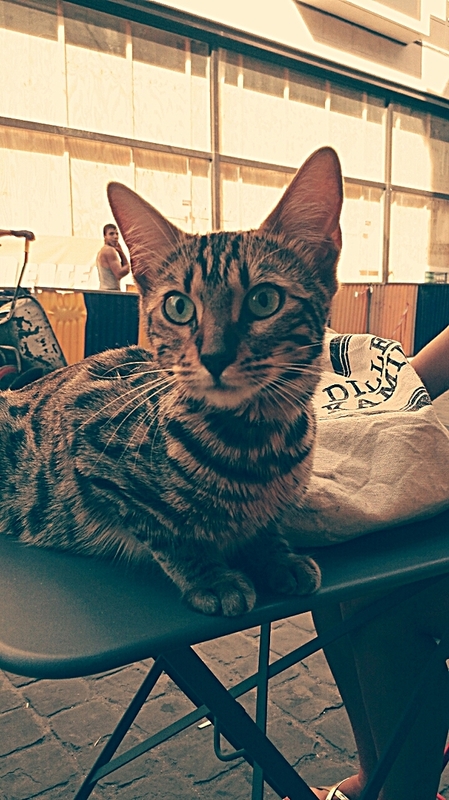 Have you seen the cat from the restaurant Le Vieux Bruxelles? I also tried a leash on one of my cats, she's very fat and I wanted to take her for short walks so she would get some exercise, but she just dug her nails on the grass and that was it! That kitty sure is a pretty one! That's one clever cat hoping for a snack. If I'm fortunate enough to return to Brussels, I will definitely be sure to go to that cafe. This is kitty is a cutie. I love that top pic especially! Aaaaaaw What a cutey. Have a pawsum day. Mom has been trying to leash train me as she has that same dream. Wish I felt more like accommodating her! I always love reading your posts, and now I realllly want to travel to Belgium! It's a French cat so of course it surrendered to the will of it's owner. I'd seriously enjoy taking my cats out and about though. I'm yet to try leashing one and I'm in no hurry to try. That kitty looks as if it has a good time hanging out with it's human. Wat een heerlijke katten, speciaal die eerste :-D ! OMG that first photo just cracked me up! I had to come see if the first photo was real, he is animate about something, probably his space. So cool the owner has the company of her cat. Now Im off to read about cat from the restaurant Le Vieux Bruxelles!! My goodness, he really had something to say in that first shot. That kitty is so expressive! I saw a woman in my neighborhood walking her cat. Yes, it should be nice to travel with a cat everywhere like this one. I would love to do it, but with Eirwena, no way! Aw! How heartwarming. I love a story like this. I have a tame little Robin. He doesn't follow me everywhere but he sits on my bedroom windowsill and waits for his breakfast, follows me downstairs and waits on my kitchen windowsill for lunch, and lands on my wingmirror to welcome me home. I have a box of bird food in every room and most pockets. My husband despairs. What an awesome cat! He's really living the great life! This is a good kitty!!! Especially in the first photo the kitty is adorable!!! I have 3 cats in my furry family. My husband swears I could convince one of them to wear a leash and go with me everywhere. That cat loves me, trusts me, and wants to be near me almost always when we are at home. I'm guessing he'd be that way if I took him out and about. 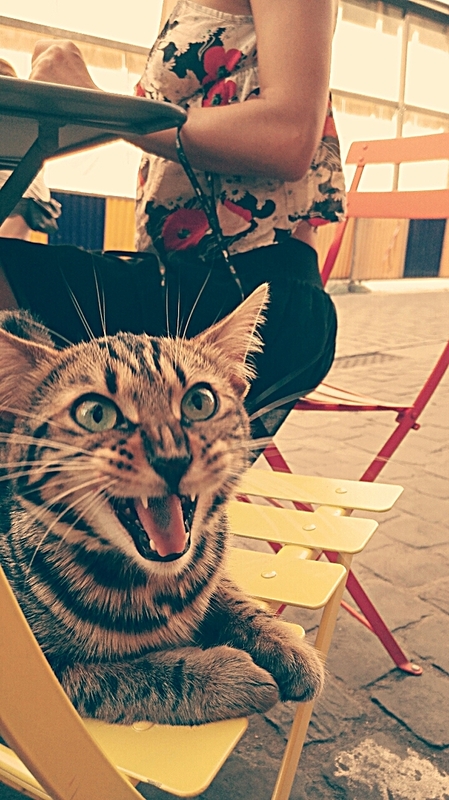 In the first photo, kitty is saying "Hey! You're interrupting our lunch." What an expressive kitty face! Thx for visiting me so that I could stop by your blog. Love your photos and your book looks fabulous. 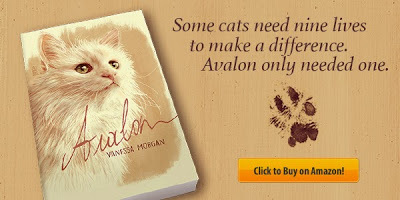 I have 5 rescue cats and love them all dearly.